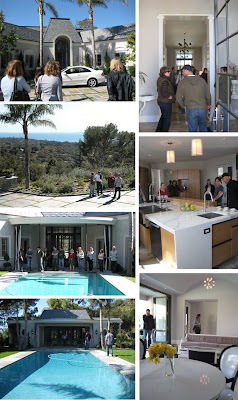 On Thursday February 19th the Shubin and Donaldson Santa Barbara office took a tour of a recently completed renovation of a John Elgin Woolf designed home in the hills of Montecito. The home was renovated by Gregg Wilson and his partner John Maienza. The estate is currently for sale and is listed by Suzanne Perkins. It was great to see a home by Woolf who’s design archive is currently housed at the UAM and had an exhibit at UCSB that was curated by my dear friend Kurt Helfrich. Gregg gave us a tour of this immaculately renovated and restored home. They did a great job of respecting the spirit and intentions of the original design while updating and revising the interior floor plan to meet contemporary needs. The materials, detailing, and design features of the home are exquisitely executed by Gregg and John. In my mind, I felt the home was a great example of how a residence can blend a more historical style with a very modern design sensibility. The floor plan responds to the amazing site with spectacular views from every room and an emphasis on indoor-outdoor living. This is a design approach consistent with the design philosophy at Shubin and Donaldson. I felt this was a great way for our office to spend the lunch hour and appreciated Gregg taking the time to walk us through the home.